You can reveiw the Donor Opportunities Information overview here for more explanation. Please contact us at fundraising@prideportland.org with any questions or for guidance. Pride Portland! brings people in the Greater Portland area together for an annual parade, festival, and numerous other events to celebrate and honor the accomplishments of the LGBTQ+ movement, raise awareness of the community’s ongoing struggles, and foster an environment of inclusivity, accessibility, and solidarity. Pride Portland! is entirely volunteer-run and relies on the generous contributions made by organizations, businesses, and individuals for the benefit of the LGBTQ+ community. Your donation this year will help us to raise awareness and highlight the important work of local organizations and businesses at the frontlines of activism, advocacy, and accessibility within our community. Thank you for your interest in donating to Pride Portland! Being a donor is a meaningful contribution to the Greater Portland LGBTQ+ community. Every donor can say they made a difference this year. Higher levels of involvement have a larger impact and therefore come with corresponding levels of recognition and public awareness in print, on the web, and on social media via the largest Pride in northern New England. Everything from venues to performances to raffle prizes make Pride Portland! possible. In honor of that, in-kind contributions of goods and services count toward donor levels and corresponding recognition*! * In-kind contributions must be mutually agreed upon and assessed at actual or fair market value. Please contact us if you are unsure which category is the best fit for you. Individuals or families, please use the Individual Donor Form. Please select your organization or business category as defined above to view the different donor levels to choose from. 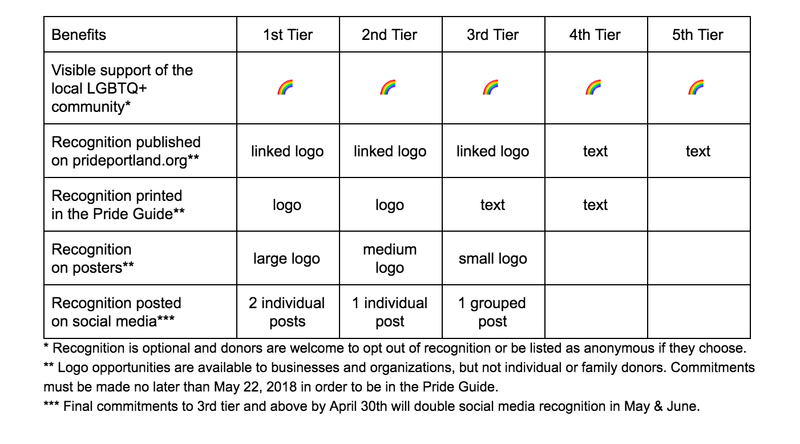 Recognition in print and on the web will be listed in descending order beginning with 1st tier. Please consider supporting Pride Portland! to the best of your ability to support the wide variety of programming we offer for the benefit of the LGBTQ+ community of Greater Portland. Are you interested in making in-kind contributions to Pride Portland! that would count toward your donor level? Please tell us a little more about your organization or business. How do you envision your relationship to the LGBTQ+ community? How do you empower and support LGBTQ+ people (i.e. your employees, members, audience, etc)? In the last 5 years, has your business or organization been publicly criticized for negatively impacting members of the LGBTQ+ community (including but not limited to people of color, indigenous people, immigrants, people of diverse abilities, neurodivergent people, people who are poor, low-income, or working class, etc)? If so, what has your business or organization done to address those concerns? Do you have any suggestions for us that would help to enrich our community's celebration of Pride? Will you need an invoice? How can we send an invoice?